Ignite Your Career With The Holiday Season! During the holiday season, it’s common for those who have spent the last few months job hunting to consider taking some time off. They rationalize that it’s the “slow time” of the year for job openings, and that job-seeking right now is more trouble than it’s worth. This couldn’t be further from the truth! November and December are among the best months for job-hunters to secure a job for themselves — and to position themselves in the front lines for the January hiring surge. There’s plenty of jobs during the holiday season, and the ratio between the number of great opportunities and applications is never better. The conventional wisdom that hiring slows down during the holidays has been time-honored (read: obsolete) for decades. Meanwhile the business world has been rapidly changing and evolving, and businesses do not have the luxury of grinding to a halt for the sake of a couple holidays. Hiring managers approach this time with a “year end” mentality, and are motivated to tie up loose ends and to secure new hires slated for the beginning of the new year. The whole company will be in flux, with budgets being set for the new year, the company restructuring, and there may even be a round of poor performance layoffs. In particular, companies with a strong forecast for profits for the coming year are interested in having all positions filled by January, in order to kick start a great first quarter. Managers who have a surplus “use it or lose it” budget for hiring will be moving quickly to use these resources. As a result, the time to fill a position shrinks significiantly — from an average of 9-12 weeks down to 3-6 weeks during the holiday season. On the other hand, managers who used up their hiring budget early on in the year may be in urgent need, and will have January 2nd start dates set for vacancies. It’s also important to remember that not all companies align the beginning of their fiscal year the calendar year. If they’ve begun the fiscal year back in October, then December is just business as usual. ‘Tis the season for resignations! More often than any other time in the year, professionals resign from their jobs in November and December. This is often to relocate and/or be closer to their friends, family, roots, and people. With the new year rolling in, it’s also when holiday raises and bonuses happen — or don’t. While some employees made the decision to hang around just a bit longer to collect that holiday bonus, other employees leave (29%, according to Salary.com) because not receiving a holiday raise was the straw that broke the camel’s back. Either way, if you’re looking for a job, this means more opportunities for you. The same year-end mentality that drives employers will drive the companies that employ recruiters. As the new year looms (and the need for recruiters to spike their end-of-the-year numbers becomes a reality), recruiters redouble their efforts to fill all remaining openings by December 31. Because this is a time when only the most motivated job seekers are still active, they’re tasked with doing so at the exact time that the flow or resumes has slowed to a trickle. If your resume is in that “short stack”, you’re looking pretty good! Fortunately for the recruiters, the holidays are a time when communication comes with ease. Offices tend to be quieter, and employers return their phone calls quickly, and with plenty of time to chat. This is Gallup’s US Job Market chart from 2008 to the present, with the dates removed below. 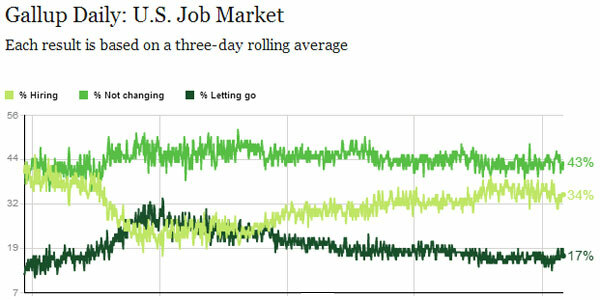 The light green line shows the job market over this four-year period. Can you identify where the four November-December periods are? Click on the image to see the actual chart (with dates included) and see if you got it right. [pullthis id=”motivated” display=”outside”]Job hunting during the holiday season sends employers the message that you’re a motivated job seeker who’s highly interested in the opening they have to offer. [/pullthis][pullshow id=”motivated”]Whether you’re trying to be snapped up in an end-of-the-year hire or you’re hoping to beat the crowd for the January rush, this is defintiely the time to be getting your resume on the desks of recruiters and hiring managers everywhere. Luckily for you, the holiday season is abundant with good excuses to take time off. With minimal resistance or questions, it’s easy to keep your schedule open for those big interviews! Employers and recruiters alike are going to have a lot more time to talk with you during the holidays. Take advantage of this, because it’s not going to last come January. Leverage your additional time with recruiters to give a more thorough presentation of your skills and achievements than you normally would — but take care not to tread over the line separating “enthusiastic and motivated” and “high-maintenance and needy”. Your chances of connecting with your recruiter will be high at this time — in fact, 78% of recruiters surveyed say they’re available and in the office during the holiday season. More than any other time of the year, the holiday season abounds with opportunities to meet face to face with recruiters, contacts, and potential employers. There are endless, completely legitimate reasons to suggest a meetup, and resistance to do so will be lower than at any other time. Shoot out a few e-mails asking to meet for coffee or lunch, and type up some well-written, personalized holiday e-mails to your network. Attend as many holiday parties (both for your company and as a guest at other companies) as you can. Talk to everyone, but be sure to maintain a relaxed, comfortable persona while doing so. Don’t forget to also continue your efforts to attend other networking events as well: if professionals within your industry are present there, you want to be too. Monitor job feeds on all of your social networking platforms throughout the season. While you’re keeping up with friend status’ on Facebook, Twitter and even LinkedIn, you might just stumble upon a job opportunity that’s precisely what you’ve been looking for. Companies that are scrambling to meet end-of-the-year deadlines — or are simply shorthanded due to employee vacations — will often turn to freelancers to fill in gaps and get them up to speed. If you’re out of work, it’s a great idea to snap up these opportunities. You’ll pocket some extra cash for the holidays, and if you perform like a champion, chances are great that you’ll be able to stay on for the long haul. A November 2012 survey conducted by Dice shows that the job outlook for December is only slightly lower than in May of the same year. Given the drop in applications, this is a fantastic time to get your name out there! While it’s true that broad-scale hiring picks up in January, it’s important to remember that the job search is a process. By applying now, you’ve sown seeds and have gotten your foot in the door for when all the major decision makers have returned from their vacations and are ready to get serious about interviewing. That being said, if you weren’t hired during the holidays, your outlook is still tremendously bright. A survey by Dice reports that nearly two thirds (64%) of hiring managers and recruiters predict that their companies or clients will be adding new technology workers within the first six months of the new year. A similar study found that 47% of managers and recruiters are anticipating increasing their staff right at the beginning of 2013. The January-February period, as well as the September-October one, shows the largest volumes for hiring, and are hot for jobs (as well as highly competitive). Be ready for the first couple weeks of January — have your resume polished, your business cards in, and a plan in place to get time off from your current job when you need it. Don’t Stop Competing Until You Succeed! Once you take a break, it’s not always so easy to get back into your working groove. Keep your momentum strong by having an ongoing commitment to your job search at all times — no excuses! At Onward Search, we’ve got plenty of open positions to fill! If you’re on the job hunt, be sure to submit your resume with us. Our recruiters will be in touch with you right away to help connect you with a fantastic position this holiday season!